Ginkgo biloba is a popular herb, with a reputation for improving memory and blood flow when taken internally. Lately, however, we’ve discovered that it also may have benefits in skin care products. 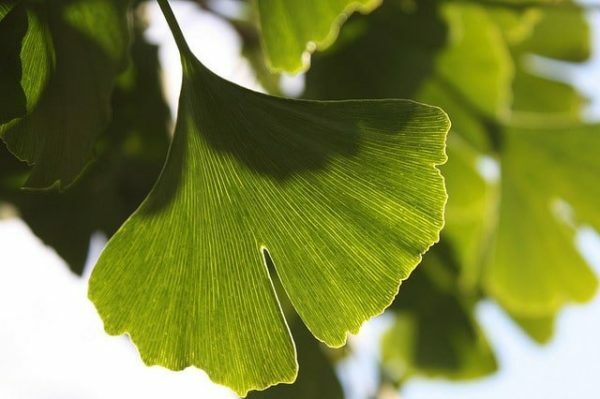 You'll find ginkgo in our Anti-Aging Facial Oil, Serum, and Eye Cream. Ginkgo is an Asian tree that’s been around for centuries. Known as one of the oldest living trees on Earth, its leaves are used to make an extract that’s one of the bestselling supplements in the U.S. and in Europe. A single tree can live as long as 1,000 years and can grow to a height of 120 feet. It’s most distinguishing characteristic is its fan-shaped, notched leaves, though it also sprouts an inedible fruit. The tree has a reputation for being “tough” and able to withstand difficult environments, as it is resistant to disease and insects, though it grows best in soils that are well watered and well drained. Ginkgo has long been used in traditional medicine to enhance memory and treat blood disorders. More recent scientific evidence has supported these uses, though not all studies have shown similar benefits. Research has shown that ginkgo may help ease symptoms in Alzheimer’s patients, may enhance memory in older adults, and may relieve poor circulation in the legs. Some studies have also indicated that ginkgo may help improve symptoms of glaucoma, and may help preserve eyesight in those with macular degeneration. According to the National Institutes of Health, ginkgo may help ease symptoms associated with PMS. Ginkgo leaves contain flavonoids and terpenoids believed to have potent antioxidant properties that may protect the health of cells and DNA. Laboratory studies have found that flavonoids can help protect the nerves, heart, blood vessels, and retina. They have also indicated that terpenoids may improve blood flow by dilating blood vessels and reducing the ability of platelets to form a blood clot. Extracts from ginkgo leaves have also shown to help with oily skin and clogged pores as well as for people with sensitive skin. Finally, ginkgo is a natural cleanser, which means it can help clean the skin of dirt, oils, impurities and other debris. Some cleansing masks are including ginkgo already for this purpose. Have you tried ginko in your skin care treatments? What did you think? Photo courtesy annemiel via Flickr.com. Ginkgo Biloba, University of Maryland Medical Center, http://www.umm.edu/altmed/articles/ginkgo-biloba-000247.htm. Ginkgo, Medline Plus, National Institutes of Health. http://www.nlm.nih.gov/medlineplus/druginfo/natural/333.html. Ginkgo Biloba Extract. BulkActives.com. http://www.bulkactives.com/ginkgobiloba.htm.